Many followers of the theory of Kerala’s genesis by Parasurama firmly believe that he had established 108 Durga temples, 108 Siva temples, numerous Sasthatemples, besides 108 Kalaris (place to learn traditional martial arts in front of the deity), Sakthi Kendras etc. Besides he had established five Ambalayas. Jagadambika of Chettikulangara, the Goddess of Oodanadu, is among the five Ambalayams. Though enough historical evidences and authentic study materials are not available to support, it is believed that this temple dates back to more than 1200 years. According to one version, this temple was consecrated by Padmapadacharyar (a leading disciple of Adi Shankara) on the Uthrittathi day of Makara month in A.D. 823. There is a firm argument that the goddess here was a family deity, and later emerged as the village and regional deity. Local historians oppose the argument that the temple is not as ancient as the nearby Kandiyoor Mahadeva temple or Mavelikara Krishna Swamy temple as it had not been mentioned in Unnuneeli Sandesam written in the 14th century. According to late Kandiyoor Mahadeva Shasthri, Samudra Bandhan – a leading courtier of Ravi Varman, an ancient King of Venad had visited this temple and wrote poems on Bhagavathi.Similarly Aadithya Kulasekharan, the King of Venad (1374 A.D. to 1389 A.D.) also had visited the Chettkulangara temple, argues them. There is also an argument that the present premises of the temple belonged to a big ‘Kavu’ (a traditional Central Travancore small sacred forest) and the Mahashilayuga Vigraha of Bhagavathi was relocated from ‘Moolasthanam’ to this place. (Some argue the place belonged to a marshy land). According to the directions of Padmapadacharya, temporary consecration was performed by Chengannur Thazhaman Thanthri and Kattuvallil Valakkod Illam Namboodiri. A year later, Padmapadacharyar came here, and Prathishta Karma was performed after 21 days of rituals headed by 31 Brahmanas. Jagadambika’s chaithanyam (divine power) was absorbed into a Sri Chakra with Saptha Dalas (seven spokes representing Saptha Mathrukkal). The Prathishta here is said to be in Rurujith style, and has Thamoguna along with Sathva and Rajo Gunas. In order to reduce the intensity of the Prathishta’s mounting fierce powers, an imaginary Mahavishnu prathishta is believed to be in place near the Prathishta. On the Bharani day of every month, the Kshethram Thanthri performs Poojas to reduce the mounting powers of the prathishita. A few centuries ago, a Salagrama donated by the Kayamkulam Maharaja was also installed inside the Garbhagriham of Sreekovil. The Ganapathi Vigraha, adjacent to the Sreekoil is believed to be donated by the Aazhvancheri Thamprakkal during the time of consecration. Pooja styles include Thrimadhuram, Cherupayasam and Malar (Corn rice) in the morning with prayers for Bhagavathi conceived as Maha Saraswathi, Uchapooja or lunch with Koottupayasam, Palpayasam and prayers offered as Maha Lakshmi, Atthazha Pooja or dinner with Neyyappam and Neypayasam with prayers for the deity conceived as Sri Durga or Bhadrakali. Sponsored by various Karas, 41 days of Kalamezhuthu and Pattu is conducted since first of Vrichikam every year. On the last day, Puram Kurithi ( homicide outside) is performed. Its Prasadam is capable of providing immunity against Small Pox and similar contagious diseases, believe the locals. Devotee offerings include Kumkumarchana, Raktha Puzhpanjali, Panthirunazhi, Bhagavathi Seva, various types of Payasams, Niramala and Vilakku, Chanthattam (advance booking is necessary for this very special Abhishekam (bathing the diety) performed with a distilled black coloured liquid that oozes from burnt teak wood. ), Udayada, lighting the Aaluvilakku (both outside and inside), Archana, Vedi, garlands etc. Special Poojas are performed on Tuesday, Friday and Sundays. Bhagavathi’s ‘Ezhunnallathu’ [The deity is taken out and goes round the temple thrice on Jeevatha - Palanquin, with her entourage] is performed on Bharani days since Vrichikam to Meenam. Devi will be taken out on ‘Kai Vattaka’ by Melshanthi during the Ezhunnallathu of Vrichika Masam. It is an important ritual performed at the Pattambalam in the temple premises during the 13 day Ethirelppu festival. Bhadrakali’s Mudi (imaginary hair of Devi – a blackboard size wooden piece with Bhadrakali’s sculpted portrait) is brought to the temple by the people of Erezha South as part of their Urulicha, and will be installed at the Pattambalam. Thottampattu is performed before this Mudi with necessary rituals and Orukku (preparations and paraphernalia). Kuruppassans of a family from Kaniyapuram near Trivandrum sings Thottampattu, (songs aimed to invoke Bhadrakali) thrice during every day of the festival. Bhadrakali’s Mudi (imaginary hair of Devi – a blackboard size wooden piece with Bhadrakali’s sculpted portrait. There are many Upadevathas adjacent to the temple, and a few Prathishtas were either revamped or added according to the Deva Prashnam by expert astrologers recently. The main Upadevathas in the temple premises are Yakshi (a typical Central Travancore concept of bewitchingly attractive fairy witches who feed on human blood, especially that of children, and with super natural powers), Muhurthi, Rakshas (a fierce super natural creature who feed on humans), Thevara Moorthy, Kannamballi bhagavathi, Ganapathi, Nagarajav (King of serpents), Naga Yakshi, Balakan, Vallyachan ( Central Travancore parlance for family chieftains, and they are worshipped by his descendants after death) etc. Besides, there is a small temple for Moolasthanam. A Kavu (a patch of small forest which houses the serpent Gods, and is common in central Travancore). Karimbana (Black palm tree) and the nearby Chembakam tree in the premises are also places of worship on the belief that they houses Gandharvas and Yakshis, the fairytale supernatural elements who accompany Bhagavathy, their master, during her trips ‘ termed as Varutthu Pokku’ in local parlance. As followed for many centuries, still elephants are not taken to the western side of the Nalambalam, fearing that the fairy creatures residing at the Chembakam may kill them. There are many popular tales (Aithihyams) related to the origin of Chettikulangara temple. The most popular one is as follows. Many centuries ago, some local chieftains went to witness the annual festivities at the Koypallikarazhma Bhagavathi temple situated a few kilometers from Chettikulangara. The visitors were humiliated and ridiculed by the Koypallikarazhma temple authorities and the village chieftains there. Perturbed by the humiliation, and out of retribution, they decided to construct a Bhagavathi temple at Chettikulangara. People of Chettikulangara united for this cause, and headed by the Karanavars (Family Heads) of the four to five then leading families of the region decided to seek the blessings of Kodungallur Bhagavathi in this mission. They embarked on a pilgrimage visiting various temples enroute and reached Kodungallur, and performed 12 days long ‘Bhajanam’ to please the Goddeess. It is said that the Devi gave them ‘Swapna Darshanam’ to say that she would soon come to Chettikulangara. Next day, they happily returned to Chettikulangara with a sacred sword given by the Velichappadu of Kodungallur temple, and started civil works of the temple. A few days later, while the local boatman (Kadathukaran) of the nearby Karippuzha rivulet was winding up his work on a late evening, he heard an old woman requesting his help to ferry her to the other shore. He felt it was his duty to help this lonely lady, and decided to accompany her to Chettikulangara, the destination she was said to be heading for. On the way, they took rest beneath a wayside tree (the place now houses the Puthusseriambalam temple), and the Kadathukaran brought food for them from a nearby house. Soon he fell asleep, and when he woke up by early daybreak, the lady had vanished. (It is said that this boatman was a Christian, and for helping Devi to ferry across the Karippuzha thodu, the descendents of his family were entrusted with the job of ‘Vedi’,- (ritual fireworks at the temple). He elaborated about this mysterious incident to the people of Chettikulangara, and they felt the Devi has reached Chettikulangara. The next day, annual maintenance works on thatched roof was going on at the Illam, (the traditional house where a community of Brahmins in central Kerala reside) adjacent to the present temple. While the Antharjanam of the house was serving the traditional local dishes like Rice Kanji, Muthirapuzhukku (a local special dish with ingredients of baked Horse Gram cereal and kneaded coconut) and Asthram (another side dish, a paste of different locally procured vegetables) for the workers, a strange old woman joined them for lunch. Soon after the food, the old lady moved to the western side of the house, and vanished in thin air with a bright glow. Antharjanam witnessed this, and she fell unconscious. Later she elaborated her experience to the people. The same day, Devi showed her presence to the village chieftains in their Swapna Darshanam. They approached famous astrologers, and in ‘Prasna Chintha’, it was confirmed that the Bhagavathi had reached Chettikulangara. Another legend related with one Kunju Varkey, a descendent of the traditional Vedi Vazhupadu family, is also popular. Like his predecessors, he was also a staunch believer in Bhagavathi. On the day after one Meena Bharani, he was visited by a group of his community to entrust him with the task of fireworks at the local church festivities. He diverted them to his brother, also an expert in fireworks, saying that he has to perform the traditional Vedi Vazhupadu while Bhagavathi returns to Chettikulangara. One of them ridiculed him and remarked whether he could witness Bhagavathi’s return from the tall Banyan tree adjacent to the temple. Kunju Varkey contemplated this, and out of curiosity, climbed up the tree in the night to secretly watch Bhagavathy’s return from Kodungallur. By early dawn, he saw a bright radiance approaching the temple at lightning speed, and could hear the sound of her Thala bangles. Bewitched and unable to withstand the sight, he fell down unconscious and soon lost his eyesight. Normally, the temple remains closed the next day of Meenabharani, the day of Bhagavathi’s visit to Kodungallur. Her return is confirmed by the broken branch of the Banyan tree in front of the temple. 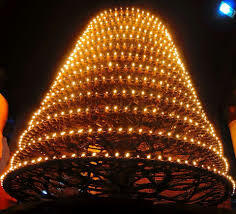 Many historians cite that the famous Chettikulangara Kettukazhcha in the present form is not more than 180 to 200 years old, and was started during the early part of the 19th century. According to a popular legend, a group of village chieftains and their workers went for civil works to construct the Kollam – Chavara Thodu (canal), about 50 kms away from Chettikulangara, in accordance to the decision from the then ruler of the region. But they could not return to their native place due to the unforeseen inordinate delay in completion of the canal. They pleaded with the authorities, but their request was turned down. 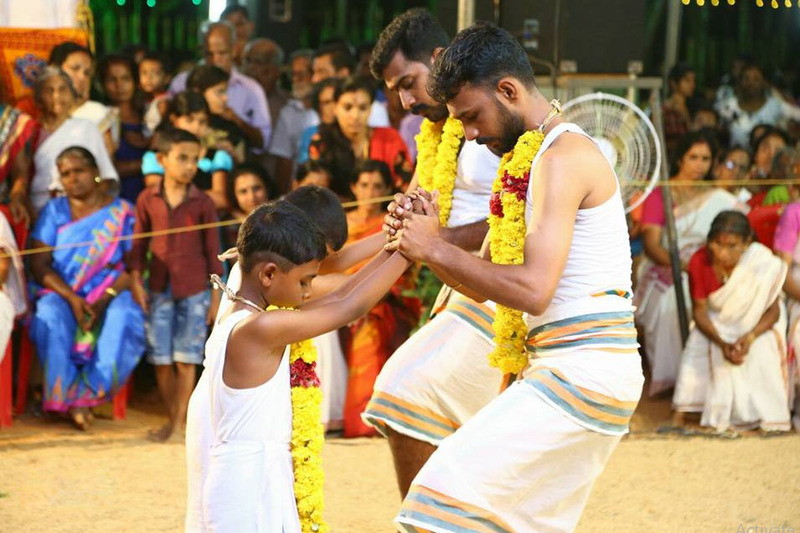 During the period, they got an opportunity to visit the temple festivities at Kollam Mulankagakam temple, and were attracted by the Kettukazhcha there. They vowed to their local deity Chettikulangara Bhagavathy, that they would construct Kettukazhchas for her every year, if they were allowed to leave for Chettkulangara immediately. There are many legends and testimony to prove the powers and presence of Chettikulangara Bhagavathy. One popular legend is related to an incident during her Parayeduppu in the Kayamkulam region, which normally falls on the Makayiram day after Kumbha Bharani. Once, while the Bhagavathi was touring the Kayamkulam side, a local chieftain of the Krishnapuram area was farming Sesame at his Kandam (a piece of farmland), along with his workers. They could hear the accompanying Vadyams of Bhagavathy’s entourage at least two to three miles away. The work was about to be finished in a few minutes, and normally it would take at least half to one hour to cover the distance from where the sound was heard. The chieftain jokingly remarked that ‘ If this Bhagavathy has so much powers, she should come here before we finish our work. If so, I shall give her a ‘Para’ here itself’. Within a few seconds, they could hear the approaching Bhagavathy. 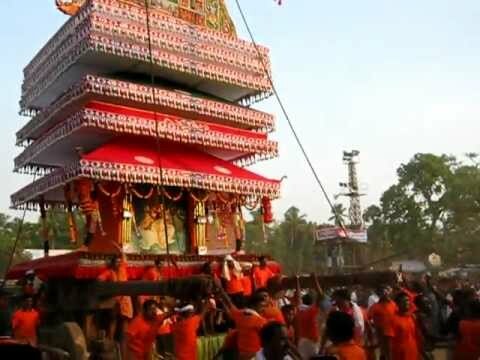 The Poojaris who carry the Jeevatha (Devi’s palanquin vehicle) were possessed by mystic powers and they ran towards the Kandam within split seconds. Soon, rest of the entourage also emerged at the scene. The Chieftain was thunderstruck and amazed by the powers of Bhagavathi, and became a firm devotee. He immediately submitted a portion of the Kandam to Bhagavathy, and now this place is known as Bhagavathy Kandam. 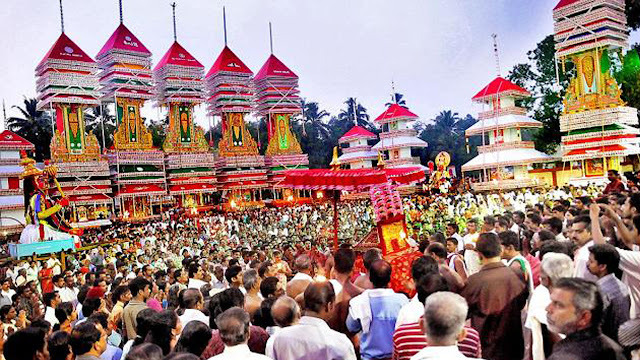 Devotees believe that the nearby Mullikulangara Bhagavathy is sister to Chettikulangara Amma. There is an interesting legend in relation to the two sisters. Mullikulangara temple also had Kettukazhcha in ancient days, though it was not as famous and elaborate as at Chettikulangara. Over the years, the importance of Mullikulangara Kettukazhcha waned and it became extinct. Mullikulangara Bhagavathi accused Chettikulangara Amma responsible for this. Out of jealousy and as a revenge, Chettikulangara Bhagavathi was offered a cold reception during her ritual annual visit to the house of Mullikulangara Bhagavathi. Perturbed by the sister’s response, Chettikulangara Bhagavathy returned immediately. The village chieftains of Chettikulangara sought the help of astrologers, and decided to curtail the trip only upto Lahe Mukku, instead of going to the Mullikulangara temple. Within short time, Vasuri (small pox) spread in different parts of Mullikulangara, and people attributed it to the ongoing feud between the sisters. People from both the region prayed for reconciliation between the sisters. Both the Bhagavathis again met at Llahe Mukku, and spent a night there forgetting their differences. In order to commemorate this event and to please the Goddesses, people offer a joint Anpoli at Lahe Mukku. Typical to other Bhadrakali temples and legends on Vasuri Mala, Chettikulangara also has similar tales to tell. It is believed that Chettikulangara Amma visits her mother Kodungallur Bhagavathi every year to participate in the Meena Bharani celebrations there. During one of her trips, the mother enquired her daughter on her life at Chettikulangara. Chettikulangara Bhagavathi replied it was ‘just pulling on’ meaning she was not able to meet her both ends. Kodungallur Bhagavathi gave her a small pack and told her daughter to strew the contents of it at Chettikulangara. She did as directed, and soon Vasuri spread all over the village. People approached their local deity Chettikulangara Bhagavathy, and offered her numerous Vazhipadus. Then onwards the income to the temple also increased manifold. There is a popular legend related to the genesis of Thottampattu at this temple. Many centuries ago, a traveller from a distant place reached Chettikulangara and spent the evening at the Aalthara ( a rest place surrounding a banyan tree) in front of the temple. During day break, he sung enchanting songs in his beautiful voice. Soon a very beautiful lady emerged from the temple and asked him to sing a few songs in praise of Bhagavathi. Since it was unnatural to have a lady like her at the temple at that hour, he enquired who she was. Bhagavathi showed him her ‘Viswaroopam’ (original self). The traveller was bewitched by her presence and bowed to seek her blessings. She asked him to show his tounge, and wrote something with her Soolam ( a short sword with three forks and a long handle, the weapon of Bhadrakali). He wrote songs on Bhagavathy and sung them in front of the temple. Still, the descendants of his family visit here to sing Thottampattu without fail during the Ethirelppu festival time.